Kohib, AKA Øivind Sjøvoll fra Sortland, har vært en viktig del av klubb-scenen i Tromsø siden 1997, først som DJ, senere som klubb-organisator. Han slapp sitt debut-album "Make Fire" i 2010, med den digitale remix-oppfølgeren "Make Fire – The Remixes" sent i 2011. Han har også remixet artister som Volta Cab (Lost Paradise Recordings), Mari Boine (Universal Music) og Flunk (Beatservice Records). I 2012 startet han en EP-serie med primært klubb-orienterte låter. Den første EP’en, Solar Day ble sluppet i 2012, og oppfølgings-EP’en Tirakan, i samarbeid med Mari Boine, ble sluppet i 2013. Han slapp så to spor på det italienske selskapet CibiCaldi records sent 2013 og tidlig i 2014. Nå avrundes omsider danse-trilogien med La Grave EP, som slippes i slutten av april. EP’en åpner med tittelsporet La Grave, med sine synkoperte house-rytmer under stemninger av aktisk ambient. The Little Giant er dypere og mørkere, med en stødig 4-4 beat, techno handclaps, også her hint av arktisk ambient, og skygger av disco-dansende buskmenn. Så slår det om til mer livsbejaende toner i avslutnings-sporet Percalaise, som hinter kraftig mot Bjørn Torske’s episke klassiker Jeg vil være søppelmann med sine perkusjons-overdoser, men der Søppelmann sklir over i skitten disco, går Percalaise mer over i boblete techno/house grooves. Kohib, AKA Øivind Sjøvoll from Sortland in the north of Norway, has been an important part of the club scene in the town of Tromsø since 1997, first as a DJ, and later as a club organizer. He released his debut album, Make Fire, in 2010, with the digital only remix-compilation Make Fire – The Remixes released late 2011. He has also done remixes for artists like Volta Cab (Lost Paradise recordings), Mari Boine (Universal Music) and Flunk (Beatservice Records). 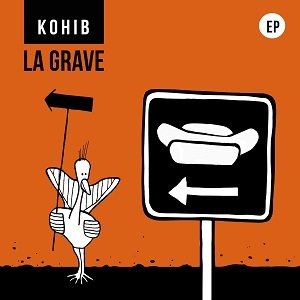 In 2012, Kohib launched an EP series focusing on club-oriented tracks. The first, the Solar Day EP, was released in 2012, and the universally acclaimed follow-up, the Tirakan EP, a collaboration with renowned ‘Sami’ singer Mari Boine, was released in 2013. Now, the ‘dance trilogy’ is finally completed with the La Grave EP, due for release at the end of April 2014. The La Grave EP opens with the title track, featuring cool syncopated house rhythms mixed with layers of moody, arctic ambience. “The Little Giant” follows, deeper and darker, with a steady four-on-the-floor beat, techno handclaps, pensive soundscapes, and shades of disco-dancing bushmen. The final track, “Percalaise,” nods heavily to fellow Norwegian Bjørn Torske’s epic classic “Jeg vil være søppelmann” with its percussion overdrive. But while the Torske’s track morphs into dirty disco, “Percalaise” moves more into bubbly techno / house grooves. These three tracks offer a distinctive take on electronic dance floor sounds, seamlessly merging disco, house, and techno elements into Kohib’s unique style. DJs looking for a club-pleasing twist for their sets, take note.